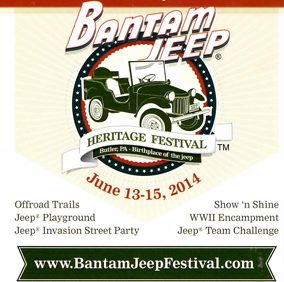 BANTAM JEEP FESTIVAL – Michele Sneddon tells about all of the interesting things going on at the Bantam Jeep Festival, June 13 – 15, 2014. The Festival will be at Cooper’s Lake Campgrounds (205 Currie Road, Slippery Rock PA) near the intersection of Route 422 and I-79 all day starting all days at 9 AM. 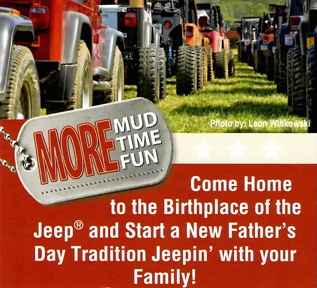 The Jeep Invasion will be in Downtown Butler on Friday 6-10 PM. 1500 Jeeps + of all makes and models from 27 states and 2 Canadian Provinces. 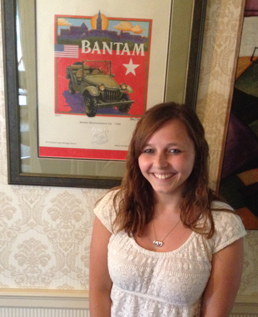 This entry was posted in Danna's Radio Diner Archive and tagged Bantam Jeep, Butler PA, Cooper's Lake Campgrounds, Jeep, Jeep Festival, Jeep Invasion. Bookmark the permalink.